What's Cooking? 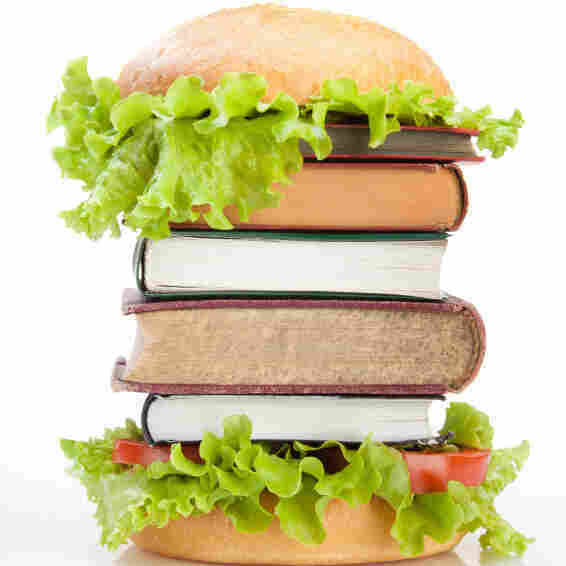 3 Books That Are More Filling Than Food Oftentimes, foodie fiction makes you hungry. But author Jessica Soffer recommends three books that deal with food yet aren't in love with it — books to read when you're on a diet, a desert island, or for whatever reason would like a peach tart to not be compared to a summer's day. Foodie fiction has become a veritable genre, devoted to deliciousness, to making your mouth water, to making you feel suddenly, irrevocably starved — and to making everything, sprouts and bologna included, an aphrodisiac. But what happens when enough is enough? Or when, perhaps, you're on a diet, or a deserted island, or attempting celibacy, or learning to live without gluten? What happens when you're hungry for the kind of fiction that concerns food but isn't in love with food — and thereby won't make you hungry, or lustful, or both? If you'd like a peach tart not to be compared to a summer's day, or not to be turned on by descriptions of aubergines, or are alarmed by the suggestion that a relationship with onion rings can stand in for a relationship with a living, breathing, friend, devour these books. And feel full. Rose Edelstein has a very strange superpower: She can taste emotion. In her mother's lemon cake: sadness. In her father's pudding: distraction. In butter, she can taste the weariness of a dairy farmer in Wisconsin. In this way, she discovers the secret emotions of the world, but more immediately, more heartbreakingly, the deepest, darkest wells of pain of her family members. In order to just sustain herself — and not feel too much — poor Rose must resort to consuming factory-produced foods: the most absent, anonymous, nonthreatening things she can find. Eating, in this wonderful novel, is not an exercise in joy, or intimacy, or beauty — or even a means toward nourishment. It is nothing so benign. At the heart of this novel is the sad truth that relationships with food, complicated and all-consuming as they can be, can wreak havoc on a marriage, a family and, of course, on a body. Edie Middlestein, our protagonist, is 5 years old and already 62 pounds when the novel begins, and upward of 332 as an adult when it ends. In between, she eats and eats and eats, and we learn the ways in which her eating has damaged her daughter, her husband, and even her relationship with her grandchildren. Food runs and ruins the lives of everyone in this book. Toward the end of the novel, we are given a food scene that smacks vaguely of deliciousness, of lust, of more traditional foodie fiction, and we're enticed — but only momentarily, as it's just a foil, a segue to the book's most heartbreaking moment, and perhaps its most inevitable. Don't let the recipes for tasty little things (bacon hash, Chez Helene's bread pudding, linguine alla cecca) fool you into believing that this is foodie fiction. It isn't. Rachel Samstat is a successful cookbook writer, very pregnant, and very much being cheated on. As she navigates life, remembers, tries to forget and pushes through, she drops in a recipe here and there. But every one should be taken with a grain of salt, as it is tempered by sorrow, loneliness, or worse. A cheesecake recipe — though perfect — comes from Rachel's father's second wife, and Rachel finds their marriage inexcusable. Carrot cake is what she feeds her husband's mistress — and with too much pineapple. It is at the exact moment that Rachel is mastering the four-minute egg that someone is murdered down the street. This is all to say that Rachel Samstat is having a terrible time, and that maybe she always will, and that often food — no matter how buttery, how delicious — is just food. And that isn't quite enough. Jessica Soffer is the author of Tomorrow There Will Be Apricots.